WOW! What a fantastic evening! 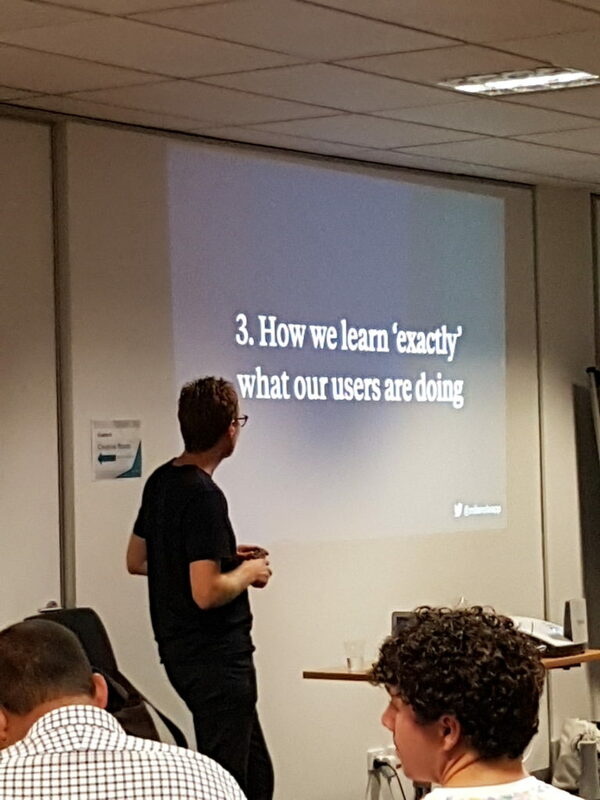 If you’re interested in user research, I hope you were there! Otherwise read on for the summary. Big thanks to Fiona Knight, one of our volunteers, for taking great notes! George Cockerill started the evening off with a discussion about how his team approached gathering user research in a project building a smart assistant for students at Deakin University. The team decided to use the Experience Sampling method. Other methods like interviews & diary studies have participants recall their past whereas experience sampling gave them access to detailed immediate needs. With experience sampling, you ask short, easy to answer questions throughout the day. For this project, the same two questions were sent to participants eight times a day over a week. Occasionally the team would add an optional question. Experience sampling allowed the team to get to very recent needs & the student’s behaviour. To collect the data, George used PACO, a free app that builds experiments quickly. It’s great for experience sampling and since it’s an app on participants’ phones they can take photos to include with their answers. Get the most from people – recruit and onboard carefully. Establish how much data points you need to help determine how many participants you should have. When you screen them, ask questions along the lines of what you’ll be asking during the research. If they can’t answer in the screener, they probably won’t provide good data during the research. Your onboarding needs to have very clear instructions. George made a video to help explain the app and expectations of the participant (including what they needed to do /when they’d get paid). Monitor it! Experience sampling is not a ‘set it & forget it’ method. You can be encouraging to the participants or ask them to tell you more about a specific thing. It’s awesome if you can instill a shared purpose of what’s going to happen with the data they provide. Use the data to help refine the problem. Start finding themes, create categories, map answers to categories to find patterns, map data to graphs and examine categories to fine tune them. Look for trends. 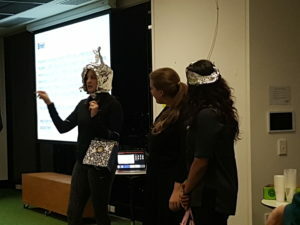 With participants using their phones, images will pick up detail the users might not think to say like how they solve their problems, their hacks, etc. You can combine the data with other research (both qual & quant). For this project, George combined experience sampling, resonance testing, journey maps from user interviews and ‘day in life’ models. Currently the student smart assistant is in a pilot with a set of students. We’re looking forward to hearing how it goes! Why is marathon running important when introducing user research to an organisation? Electronic Arts operates 8 research labs across 4 countries but it’s still early days for the games industry to embrace user research. In the APAC region, Kostas Kazakosis the 1st UX researcher at EA and thus needed to help communicate the value & importance of UX research. Using ‘The Reflective Practioner‘ by Donald A Schon, Kostas reflected on his journey as a marathon runner and introducing UX research to a company – both ongoing! Excitement where anything is possible! 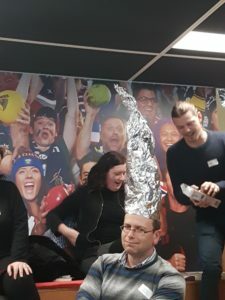 The organisation has no prior exposure to formalised UX research. Denial when doubt starts to creep in. Here Kostas realised he didn’t know much about the FireMonkeys’ development process. Shock where everything seemed to be really difficult. Kostas had to show the value of UX research, create a research space and creating research protocols to suit the games industry. Kostas’s plan was relying on the importance of dialogue: talking to people, understand what they do, and showing UX research helps them. This is where empathy is important but how do you do this? You empathise with the data and people and match it to research question. Despair usually happens about mile 19 in a marathon. When you start to question if you really can do this, if you’re ready to do this and will it be ok? The wall at mile 22 is when your brain doesn’t talk to your body anymore. You need to take one step at a time to keep going & identify mistakes and address them quickly. At EA, this meant all that earlier work to establish relationships with the team enabled collaboration. He had helped educate them & gave them ownership. The teams had begun the process of seeing the importance of data & value of user research. Affirmation at mile 23 is feeling like you have a break thru. This is the stage Kostas is currently at work. He’s seeing people want to get involved in the UX research and wants to be able to sustain that team participation. Elation at the finish line of mile 26 is when you’ve achieved the goal and need to shift your mindset towards the future. At work, this is what Kostas is working towards. In summary, the DECEMA frame of reference that Kostas described – Dialogue, Empathy, Collaboration, Empowerment, Mutual respect and Advocacy – can take you a long way when introducing user research to your organization! @product_anon @GeorgeCockerill Kostas Kazakos, Thank you! I got more professional development tonight, than from work in the past month. Thanks to both George & Kostas for a great evening and to Seek for hosting us!!! In April, one of the founders – Michael Trounce – of Melbourne startup Milanote, the notes app for creative work, let us in on a few secrets of their success. First of all, it’s been 3 years in the making. The 4 founders already have their own UX consulting business, Navy Design, and always had the ambition to start their own product business so back in 2014 they dedicated a week to working through potential product ideas. Ideas like a weather app and a hydration coaster were investigated then ditched (the coaster was referred to as a gimmicky Xmas present…). They started working on a product which would solve a need their team had. Previously they had used post-its, a wiki, and other note keeping software but they all lacked a way to make connections and share. During 2015, they began doing research with designers & other digital creatives and found there was a gap in the market for the product they had in mind. They build a (crappy) prototype & started using it in-house. They knew they were onto something when they found it worked better than any of their previous tools – whiteboards, Evernote, Trello, etc. It later clicked that what they’d built wasn’t just a tool that could be applied to the UX design process, it was a tool that could be applied to any creative process. 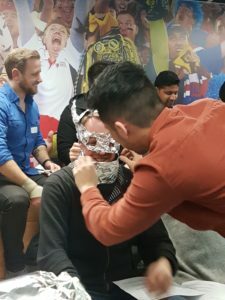 This insight broadened their market significantly and gave them the confidence to then break out the product from an internal project within the consultancy, to a product business in its own right. It wasn’t until 2016 the focus changed to execution and as a result the hours of effort went up! They hired a small full-time team and ran a closed beta program for 6 months. Until then they were seeing where it would take them but those days were over. When they did launch in Feb (2017), there was a flurry of press including reaching #1 on Product Hunt, the front page of Hacker News and #1 for the week on Designer News. It’s also been written up on Lifehacker and The Next Web covered it while it was in beta. Milanote can’t see your content due to privacy reasons. They have no idea what you are doing with their product or how you are using it which makes deciding on what features to build and understanding customers somewhat difficult. To overcome this challenge, the Milanote team are using a mix of quantitative & qualitative methods to draw out data and feedback from their users along the different points in their product journey. The most obvious tactic is talking to its customers. They are continuing to evolve their thinking on pricing & looking at different models to help align the value of the product with the price. The articles at launch including Product Hunt, #1 for the week on Designer News and word of mouth helped greatly with new customers. They need to experiment with other methods now to find scalable and repeatable ways of driving acquisition long-term. Milanote are currently looking for both developers & marketers. Check out their jobs. AND the most shocking news of the evening!!! The Milanote team do NOT use post-its anymore! They have bare walls! Thank you Michael for a great talk & elabor8 for hosting the evening! Back in March, we discussed different types of user research and focused in on diary studies. In May, we’re talking about how work with those insights to build products and some of the challenges you may face. We have 2 amazing speakers on Thursday May 25th with first hand experience.Through a case study and reflection, they’ll show what it’s like to run user research and let the results drive the product & features. 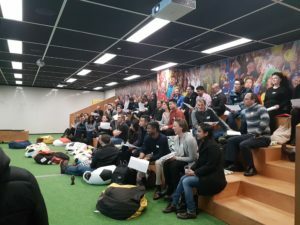 In this case study, George Cockerill will share how using the Experience Sampling method gave rich insights into user needs for the feature ideation of a brand new mobile app at Deakin University. As part of the research activities to inform the development of a smart assistant app for students, Experience Sampling quickly gave the product team useful and relevant data to help understand student needs, behaviours and pain-points in multiple contexts over time. George will talk share his experience of planning, executing and analysing the results from an experience sampling study. With practical advice on how to run the study, tools and techniques, the key points you need to know and things to watch out for. 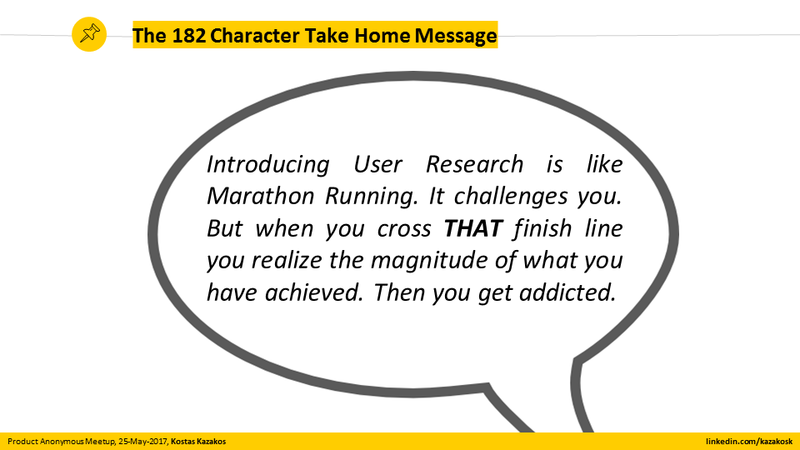 Why is Marathon Running Important when Introducing User Research? During the last decade, user research has been a key component of the product development process. Within the games industry there has been a significant effort that focuses on introducing and integrating user research as part of a ‘player first’ culture. Numerous challenges exist when doing so -especially when working with teams who have not been exposed to user research previously. He will also introduce DECEMA – a frame of reference whose aim is to help UX practitioners when introducing user research to development teams and organizations. George Cockerill is a Senior UX Designer at Deakin University, a Lead UX Instructor at General Assembly, an organiser of the UX Melbourne Book Club and can be found on Twitter at @GeorgeCockerill. Kostas Kazakos is a User Experience Researcher with a qualitative mind and a quantitative heart. He currently manages the user/player research at Firemonkeys (an Electronic Arts studio located in Melbourne). For the last 10 years, Kostas has been handling primitive research problems in the mobile space and turning them into actionable design insights by employing a palette of qualitative and quantitative methods. He is an advocate of experience-centred design and passionate about answering the ‘why’ behind the ‘what’. We’d like to thank Seek for being our hosts this month! We had 2 great talks about customer research for our March session. 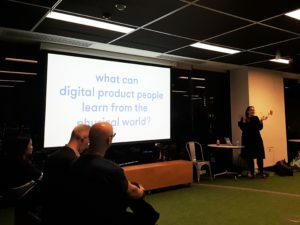 Thank you Jo Squire & Katie Phillips, both User Experience Researchers from Australia Post, for an excellent evening! FYI, we’ll be running another session on customer research in a couple months so hope to see you there! The research method you use will vary depending on several things including if you’re in a discovery or validation phase. If you are in discovery, you might be looking for the problem or trying to get a better understanding of the problem. 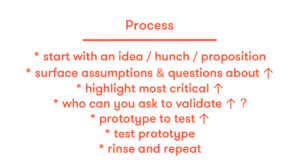 In this space, you’re looking for ‘why’ and it’s not at all the time to bring in prototypes! Observation, contextual inquiries and questionnaires are some of the methods to use here. 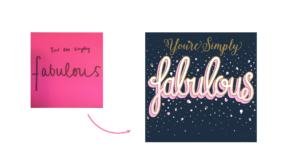 Once you move to validation, you’re looking to understand ‘how’ ie how is the product being used. Usability testing & co-design workshops are some of the methods you can use. Jo reminded us that ‘research’ doesn’t have to cost a bomb or take a long time. No matter what your budget, everyone can incorporate research into their product. Low cost options include talking to your customers on the street, observing (potentially free!) & you can be creative about how you reward the participants. Once you do the research, you need to communicate it within your organisation and the best way to do this is to include your stakeholders while you’re doing the research. If you can’t include them, try showing the video you captured during the research. Katie talked us through a diary study she did for an Australia Post product. This was a product in the wild which was being constantly developed. Based on the research objective & other criteria, they decided to use a diary study & moderated user testing. Their research participants were not in the office so they choose remote user testing using live video/screen sharing for the user testing and Slack for the diary study. To select a research method there are several things to consider including the objective, how much time you have and your budget. This is the 2nd time the AusPost team used Slack for research. 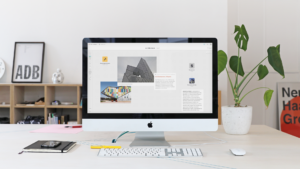 Even though none of the participants had used Slack before, it was easy to onboard them and they understood how to communicate & share photos of their processes. One of the things Katie talked about (which I think was amazingly fantastic!) 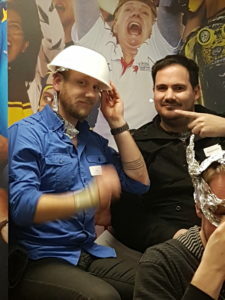 is how involved the development team was during the research. They witnessed the screen sharing so knew right away about the problems users faced plus they scheduled time into their existing sprint so they could work on anything that came up during the research. Way to work together! Tools for analysis – Depends on the research but they utalise Google sheets & post it notes a lot. After you analyse the data, make sure it’s available to the project team & possibly other teams (to help with their problem solving). Most challenging part of their job? It depends on the project but often it’s recruiting of the research participants. Others include: having a prototype with the right tasks, getting clear objectives from stakeholders and deadlines that are very close to the product launch. Are there tools for privacy/ethics/legal? Tips? Make sure your participants know what is expected of them & that the product is being tested, not them. You should have them sign a non-disclosure agreement and your legal team (or participant recruitment company) will have other templates you can use. Thanks tons to Aconex for hosting! 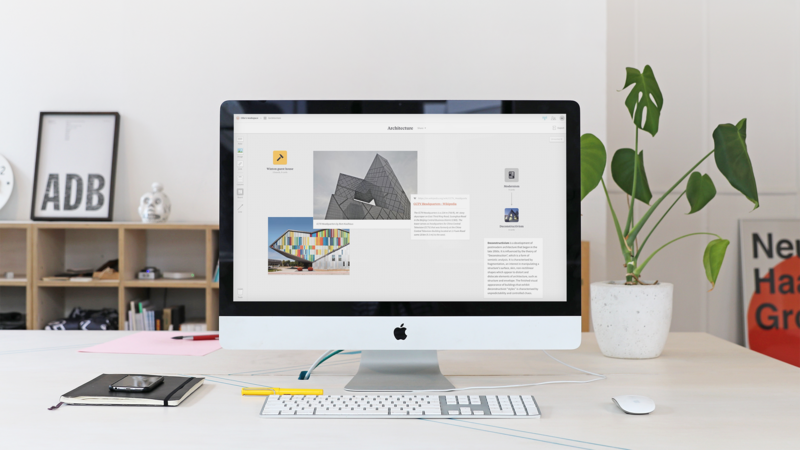 Milanote is a visual workspace for creative thinking. It’s used by designers, writers, marketers and other creative professionals from companies like Facebook, Apple, Uber, Dropbox, Google, Adobe, Sony, Nike etc. Milanote launched on 7th Feb of this year and reached #1 on Product Hunt, the front page of Hacker News and #1 for the week on Designer News. It’s also been written up on Lifehacker and The Next Web covered it while it was in beta. Michael Trounce is not only one of the co-founders of Milanote but also the GM of Navy Design, a UX design consultancy focused on health. RSVP for Thursday April 20th when Michael will join us for a Product Anonymous Startup Session. This month we’re being hosted by elabor8.